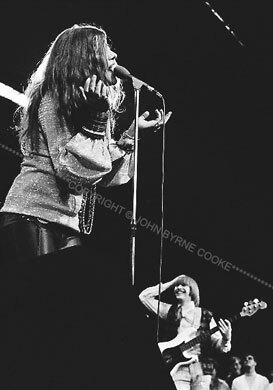 Janis's only European tour took her to Stockholm, Amsterdam, Frankfurt, Paris, Copenhagen, and London, where she sold out the Royal Albert Hall and had the staid Brits dancing in the aisles. In Frankfurt, American servicemen and their families made up most of the audience and Janis pulled out all the stops for them. No one was appreciating the note she was hitting at the moment I took this picture more than the bass player, Brad Campbell.